NASPA is excited to announce its 2019 President, Louise Jones. 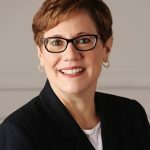 Louise was sworn in to the President position on March 23, 2019 at the NASPA 2019 Spring Meeting, held in conjunction with the APhA 2019 Annual Meeting in Seattle. 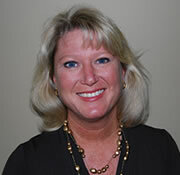 Louise is the Chief Executive Officer of the Alabama Pharmacy Association (APA), a position she has held since 2006. As CEO, she oversees all aspects of the association’s operations, as well as advocacy efforts on behalf of Alabama pharmacists and pharmacy technicians. Her primary focus is protecting the profession of pharmacy in her home state. 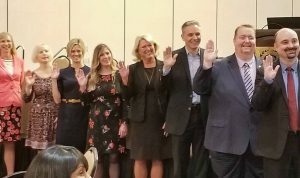 The 2019 NASPA Board of Directors are sworn in at the NASPA 2019 Spring Meeting in Seattle. Louise earned her Bachelor of Science in Psychology from Auburn University. She began her career in pharmacy at the Alabama Medicaid Agency, where she served as director of Pharmacy Services. She left Medicaid in February 2005 to serve as the executive director of the Alabama Board of Pharmacy. Louise was awarded an honorary pharmacist license by the State Board of Pharmacy and was inducted into the Samford University Chapter of Phi Lambda Sigma Honor Society as an honorary member. In 2014, she was awarded the Hibbett Patient Care Excellence Award for outstanding achievement in the development of community-based pharmacies in the state, and in 2018, the Auburn Pharmacy Alumni Association presented her with the Distinguished Service Award. Governor Kay Ivey has appointed her to serve on the Alabama Opioid Overdose and Addiction Council. Louise will also be inducted into the Robert E. Lee High School Hall of Fame next month.